Reading together with your child is the best way to help children get ready to read on their own. Read for a short time, and then for a bit longer, as your child gets older. Ask library staff to help you pick books to share with your child and let your child choose books on their own too – let them take the lead. Let your child see you read for pleasure, too! Reading and writing go together. Encourage your child to put ideas on paper, like what they did during the day, a list of their favourite books and a grocery list. Scribbling is the first step to writing, and it may become artwork too! Songs are a terrific way to expand your child’s vocabulary, to play with rhyme and rhythm and a wonderful way to hear the different sounds in various languages. Sing with your children, anytime and anywhere! Each WPL location has toys and other manipulatives for families to play with. Play promotes language development, self-expression and fun. 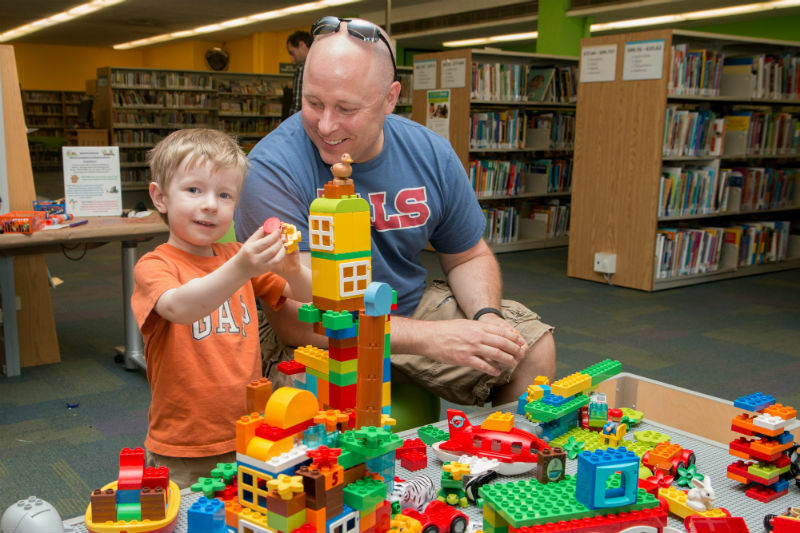 Our goal at WPL is to encourage families to play and learn together. Start talking with your baby at birth – describe your day and what you are doing. It doesn’t matter what you say, just keep talking. Children need to hear sounds before they can make them. Talk, talk, talk! Talk to your children in the language you are most comfortable with. This will help them build stronger vocabularies and competent conversation skills.